Why am I still doing this? Those who have been long-time readers (you know ... all ten of you) know that I was really on the fence for doing a twelfth year. Primarily because of the downfall of the lists punctuality. Early on, the year-end review would be released by mid-January. Over time, it slipped to first week of February, which then slipped to just in time for the Grammys, which slipped to sometime in February. If it wasn't for Leap Day last year, the list would've been published in March. Eleven years felt like it might be the right time to hang it up. Each year, I've always closed the best of email off with "a firm handshake to Ant Miloscia, The Godfather of Music Lists." And over the years, people have asked who he was or whether people could get Ant's list, too. I've known Ant for half my life, literally. We met when my brother got engaged (and later married) to his sister. I remember seeing his music collection, which in 1994 was approximately 300 cds, and thought to myself, "who on earth has that much music?" Funny thing is, it's practically a rounding error to what he compiled over the next 18 years. Given the distance, we didn't see each other that much, but always kept in touch over three key topics: family, fantasy football, and music. Ant began including me on his year-end music lists, which back then seemed like a foreign concept. We agreed on #6: "Travis, The Man Who - another band in the vein of Radiohead." When it came to music leads, Ant was your go-to man. "Young MC," he wrote me in the summer of 2001, "How can you live in Chicago and not know who Pete Yorn is?" 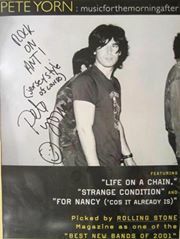 Later that summer, I saw Pete Yorn at Schuba's Tavern and got his autograph for Ant. "He's from Verona, huh?" Yorn said, as he signed the concert poster, "My dad has a dentist office near there." Six months later, I published my first best of list. Number one, with a bullet: Pete Yorn - musicforthemorningafter. If it weren't for Ant including me on his distribution list for his Best of 2000 list, there would never have been a Cuckoo's Eleven - not in 2001 and certainly not twelve years later. And if it weren't for Ant, I don't know if I would've known to place Pete Yorn at the top of my list. "Kiss and Ace...Never forget where you come from...Kiss cd cracks me up...Listen for the classic Paul scream towards the end of the sound...Ace cd is pretty good...Ace takes the honor that I actually bought his last cd (it came out in 1989) and I can't say that about any other band from that era for me..."
We stayed connected on fantasy football, as well as some other music topics I'll find another time to write about. But when it came time for the year-end lists, his was the response I always looked forward to the most. Nothing more satisfying than an email from Ant saying "Commish - you got it right this year." I never expected that the responses would end. Unexpectedly, Ant passed away last fall. My friend Chris said it best, "This one of those moments where you receive news and you can literally feel your heart sink." He had never met Ant in person, but over the years they corresponded about music. To me, that's the best example of Ant; you didn't have to see him everyday to realize how good of a person he was. Each time I email the usual suspects about new music, Gmail suggests that I add Ant to the thread. Talk about a tough reminder that the good ones leave us far too soon. So when the end of the year came, there wasn't a doubt in my mind that I should do at least one more list in tribute. As luck would have it, his wife Sherry forwarded me the list he'd been compiling for his own year-end mix. Seeing how his list was coming together, I think that I would've received the email I always hope for. Looking back on the conversations I had with him, two emails come to mind. First, the last (email) conversation we had - brief but still memorable. We joked about "Gangnam Style" and the thrills of toddler television programming. I used a go-to inside joke that hadn't been brought up in years, which got a good laugh out of him (note: I also used it in this note as well, couldn't resist). Ant never seemed further than an email away, and I'll miss our conversations. So without further adieu, here is the best music of 2012. And as always, a firm handshake to Ant Miloscia, The Godfather of Music Lists.